Without a doubt, most people walked backwards to find If I Could Do It All Over Again, I’d Do It All Over You from the success Caravan had with In The Land Of Gray and Pink, with this album seeming to have gained more praise and acceptance as the years have rolled on. Perhaps one of the finest psychedelic bands to rise out of the late 60’s, Caravan soon found more comfort within the genre of progressive music, though that was certainly not the case in the early years, where unlike bands such as King Crimson, what Caravan present here is a carefree attitude filled with an infectious and even a sustained enthusiastic joyous ovation for the times, the musicianship, the kindred spirit, and yes of course the partaking of mind expanding substances. 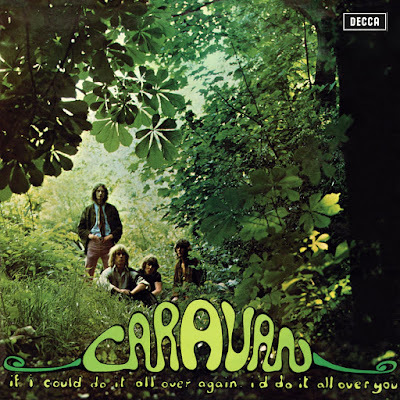 Caravan was certainly having a great deal of fun as their tightly constructed songs moved forward on a sea of lyrics that were completely nonsensical, and if not nonsensical, certainly nearly completely random, because the lyrics they laid down were entirely unnecessary, simply providing a vehicle for which the band could ride as their instrumentation evolved. I for one have always considered how wonderful it would be to hear the music of Caravan stand on its own two feet, devoid of any lyrics … but then, the lyrics push the music as much as the music pushes the lyrics, until both are so intertwined that the vocals become part of the instrumentation, creating their own sense of harmonic emancipation. Several of the albums have inherent sexual overtones to their titles, and others can be taken on several levels, consider: For Girls Who Grow Plump In The Night … Cunning Stunts or All Over You … Too. Yes, it was a time of searching out, breaking established rules, and ordering breakfast for dinner. *** The Fun Facts: The album title and title of the title track is a quote often attributed to Spike Milligan [Terrence Alan Milligan, a British comedian, writer and musician] but equally possibly deriving from a bootlegged Bob Dylan song “All Over You” (“Well, if I had to do it all over again/Babe, I’d do it all over you”). The cover was shot in Holland Park, London and was photographed by David Jupe.